The UK’s chaotic capital feels a lot calmer when you’re looking down on the action from up high! If you’re looking for the best views in London, look no further than this list! If lookouts could kill, The View from the Shard would finish you off. Winner of the Best Attraction RVA award, this towering top attraction offers unrivaled 360-degree views of luvverly London! 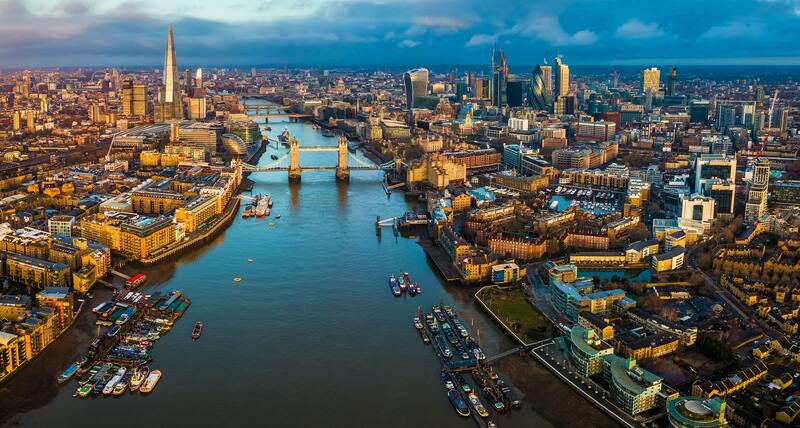 From a height of 300 meters, see the London Eye, the Tower of London, St. Paul’s, the Thames and more! If you’re feeling swish, opt for an upgrade and get a glass of Moët & Chandon Imperial Brut Champagne at the bar. Soak up the splendor of those skyscrapers from the top of Primrose Hill, a 65 metre hill on the northern side of Regent’s Park. It’s spectacular in summer, when sun worshippers sprawl on the grass on their picnic blankets and gaze upon central London, Hampstead and Belsize Park from a distance. In winter the views are just as magical, but it might be too cold and windy to sit down for long! Can you find the engraved quotation from William Blake? Once the world’s tallest ferris wheel, the London Eye is now second to Las Vegas’ High Roller, but the views of the city from the 32 air-conditioned capsules are some of the best in town. Enter your pod with up to 25 people and get ready for 30 minutes of dazzling views from the Thames river to Big Ben and beyond. Book ahead! More people visit the London Eye every year than the Taj Mahal! It’s worth the ride on the DLR to one of London’s most leafy green locations. Greenwich Royal Park offers amazing views of the London skyline from the top of the hill. While you’re in the area, why not explore the meaning of time at the Royal Observatory? Learn all about the Greenwich Meridian Line and GMT, then step onboard the Cutty Sark and walk around the insides of an old tea clipper. The views of the Thames are great from the deck. Alexandra Palace, affectionately known as Ally Pally to Londoners, opened to the public in 1873, and has survived two fires, hosted the world’s first TV broadcast and brought amazing events to people who’ve travelled from all over the planet! Crowds pack the sloping lawns in summer, but if the weather’s no good for outdoor lounging, grab yourself a proper English pint of beer in the pub at the top and admire the views from inside. For jaw-dropping views of St Paul’s Cathedral, the busy City and beyond, One New Change rooftop is a must. It’s even better at sunset, when the light can fall just perfectly on the scenery (and you) from where you’re standing. Madison’s Restaurant and Bar on the rooftop can mix you a great cocktail so you can enjoy those breathtaking panoramic views in style. It’s a great place to impress a date, and you can even take a yoga class up there! Want to get the most out of London? Check out everything else Tiqets has to offer in the UK capital.